Electronic negotiations concern transactions on the basis of electronic media, such as the Internet. Platforms have been developed to aid participants in electronic markets during the agreement phase. The key activity in this is the matching of offers and requests, for which we need a ranking of the alternatives. 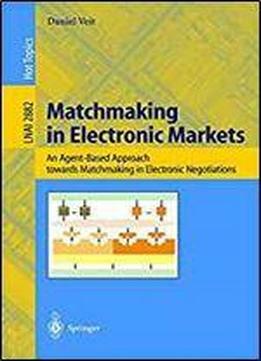 In this book the author defines a framework in which a ranking can be generated in order to acquire an optimal decision for a desired transaction - this process is called matchmaking. The author introduces a generic framework for multidimensional, multiattribute matchmaking, its implementation, and an analysis of it. The genericity of the author’s approach means that the implementation, realized as a multiagent system, can represent both offering and requesting agents, and the framework can be applied to a huge variety of applications. The use cases in the book are derived from the human resources domain, and thus involve quite complex matchmaking. The author’s presentation is thorough and self-contained. He provides definitions of the relevant business and computer science terms, and detailed explanations of the underlying mathematical tools and software implementations.